The NBA Cheat Sheet is an article that will come your way five days a week all season with the goal of breaking down the best and worst fantasy basketball matchups/spots at each position. The only difference today? I’m writing it instead of Julian, but you can still bombard him with questions on Twitter. I can’t control your life. It’s crucial to have all the latest lineup and injury news when constructing your fantasy basketball lineups. Make sure you’re following @DKLive for every update, and also, once again, feel free to hit up Julian with any comments or questions — @JulianEdlow. While Stephen Curry’s ($9,300) value might seem in peril thanks to Kevin Durant’s ($8,800) return to the lineup this evening, it might actually create an opportunity to get the All-Star at lower than normal ownership. For the season, Curry’s DFS output really hasn’t been too heavily affected by Durant’s presence; as the guard’s DKFP per minute average drops only from 1.42 without Durant to 1.34 with him. De’Anthony Melton ($3,100), who put up 29.0 DKFP starting in place of Tyler Johnson ($4,600) on Saturday, should be in line to easily hit 5x value once again if Johnson’s knee ailment persists. However, it should be noted that Troy Daniels ($3,100) has also drawn a recent start with Johnson missing. Regardless of the bad matchup on paper, this will be a smash spot for Dennis Schroder ($5,100). Russell Westbrook has been suspended for tonight’s proceedings following the All-Star picking up his 16th technical foul of the season on Saturday. That means Schroder will be unleashed and doing his best Westbrook impersonation. He’s already got the utilization numbers down. In the 966 minutes Schroder’s played without Westbrook in 2018-19, he’s carrying a massive 33.0 percent usage rate. Schroder’s also averaged 37.3 DKFP the eight times this season he’s specifically started in Westbrook’s place. All three of these great matchups are generally a product of pace. Across their past 15 games, both the Thunder and the Wizards rank inside the league’s top 10 in terms of possessions per 48 minutes; while, over that same span, the Pelicans lead the NBA (107.6). Still, the list of DFS options on the Heat, Jazz and Mavericks get pretty inconsistent after Donovan Mitchell ($8,200). Josh Richardson ($5,900) has only posted a usage rate above 20.0 percent twice in Miami’s last 11 contests; Dion Waiters ($4,400) has hit 5x value just four times in his past 10 starts; and Tim Hardaway Jr. ($5,200) is incredibly affected by the likely return of Luka Doncic ($8,900). Will the NBA’s stoutest defense against shooting guards deter me from using Bradley Beal ($9,400) in lineups tonight? No. It will definitely not. Beal is simply too safe an option at this point to ignore. Not only has the Florida product dropped 40 points in consecutive games coming into Monday, he’s also hit 5x value in 15 of his last 17 contests. 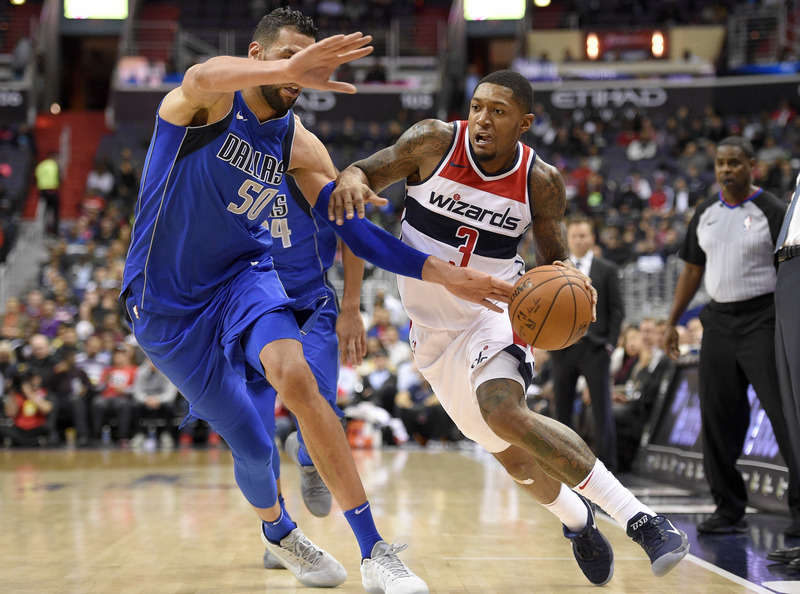 In that span, Beal has been an incredible mix of volume and efficiency, averaging 39.9 minutes on a nightly basis to go along with a .628 true shooting percentage. If the aforementioned Doncic is, in fact, back in action tonight, he stands to be a very popular play. Rightfully so. The Mavericks generally run one of the league’s slowest offenses, but they should be forced into a more uptempo style of play by the Pelicans. Adding that level of pace to a player who can claim to be leading the NBA in touches (97.3) over his past 10 appearances is a pretty tantalizing combination. Bojan Bogdanovic ($5,900) offers a cheaper alternative, too. Prior to being held to 25.5 DKFP against the Nuggets on Saturday, Bogdanovic had hit 5x value in 12 straight starts. He’s been amazing in the absence of Victor Oladipo. The loss of C.J. McCollum makes one want to try and find some value with the Blazers – even in a difficult spot – yet, it’s hard to get a grasp on just what their new rotation will look like. Rodney Hood ($3,700) will likely see the biggest boost from a fantasy perspective, but his one-dimensional archetype is insanely unappealing. In fact, if you took Hood’s 3.7 percent total rebounding rate with Portland and prorated it across the entire season, only Terrance Ferguson ($3,100) would have a lower mark among player with at least 500 minutes under their belt. Hood’s assist rate isn’t any more inspiring, either. Pascal Siakam ($6,800) has been stepping up all season long when the Raptors are undermanned and tonight he’ll be presented with that opportunity once again. Serge Ibaka has one game remaining on his suspension, Kawhi Leonard has a load to manage, and Kyle Lowry ($7,300) has missed Toronto’s past two games with an ankle injury – leaving him questionable for this evening. When none of the three have been on the floor, Siakam’s led the team in usage rate at 28.6 percent. He’ll be option No. 1 against a Knicks team that is allowing the second most opponent points per game in the paint among Eastern Conference teams. Derrick Favors ($5,800) is also extremely viable, as he’s averaged 38.7 DKFP across his past three contests. While his addition to the starting lineup proved plentiful in early returns, Bobby Portis’ ($6,000) role has shrunk significantly in recent games. The former Bulls draft pick has logged fewer than 25 minutes in each of Washington’s past three contests and, unsurprisingly, this has led to Portis failing to reach even 3x value twice within that span. He’s a pretty obvious avoid on Monday. Going back to Feb. 11, Robin Lopez ($6,200) has been a completely different player. In that 15 game run, the veteran has exceeded 30 minutes of action on 11 occasions; he’s hit 6x value 10 times; and he possesses a beautiful .628 true shooting percentage. Considering the Suns allow a league-high 52.8 points in the paint per game to go along with the worst rebounding rate in basketball (46.6 percent), this matchup should be a slam dunk, right? Well, I might proceed with a little caution. Lopez’s price tag has only been above $6K twice in 2018-19 and both times he’s failed to reach value. He remains a perfectly viable option on this slate, but I might be inclined to pivot to struggling teammate Lauri Markkanen ($7,000), who presents a much higher ceiling. The two highest-priced centers on this evening’s slate – Nikola Jokic ($9,200) and Andre Drummond ($8,600) – are both in what could be deemed “bad matchups.” Of the duo, I’m more trusting of Drummond, who has a double-double in all three meetings he’s had with the Cavaliers so far this season, including two 50-plus DKFP performances from early in the schedule. However, with Rudy Gobert ($8,300) in a prime spot against a Wizards team that’s allowed the most points in the paint of any Eastern Conference squad, you really don’t have to use either if you’re looking to pay up. Bradley Beal, WAS vs. UTA ($9,400) – Until it doesn’t work, I’m going to keep going back to this well. Beal is the lone man in the NBA averaging more than 40 minutes per night across the past 10 games. There’s so much inherent value and safety in that level of workload. His price should be above $10K. Dennis Schroder, OKC vs. MIA ($5,100) – It’s chalky and the matchup isn’t ideal, but Schroder consistently returned value across a decently-sized eight-game sample without Westbrook around. We don’t have to imagine what ceiling is tonight. We already know it. Pascal Siakam, TOR vs. NYK ($6,800) – While Lowry could still suit up on Monday, we know that Leonard has already been ruled out. Since the beginning of February, Siakam has seen his DKFP output jump from 0.94 points per minute when sharing the court with Leonard to 1.39 points when the All-Star is absent.